Please join us for the next Open House Art Gallery on Saturday, March 28, 2009, starting at 5 pm. Frederika Sumelius, talented artist and dedicated social activist, will be presenting photographs of the ethnically cleansed Roma, Ashkali and Egyptian minority women and their families in Macedonian refugee camps as their homes were destroyed in Kosovo after the end of the 1999 NATO Bombing in Yugoslavia: some biographies the women wrote of their lives before the bombing, during their plight; and examples of hand-work they created in income generation projects program created by Frederika. 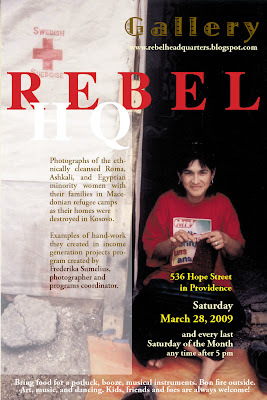 This entry was posted in Rebel HQ art gallery painting photography Roma Gypsy on March 3, 2009 by dorota.